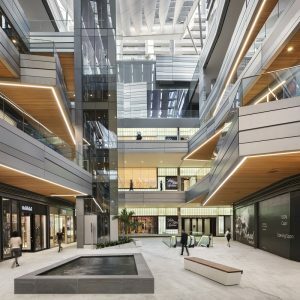 As award-winning architect John Pauline settles into his new role as Managing Director & Design Principal at the Hong Kong office of renowned Miami-based architectural practice Arquitectonica, PRC showcases one of the most longawaited and most ambitious private projects in the modern history of Florida’s largest city. As the brainchild of the Miami subsidiary of Swire Properties, which has headquarters in London and Hong Kong, the US$1.05 billion Brickell City Centre in downtown Miami is a 501,700 square metre mixed-use development covering three city blocks and comprising retail, office, hotel and residential space. Future phases being planned include three additional blocks. From the planning stage Arquitectonica collaborated closely with landscape architect ArquitectonicaGEO to deliver an extraordinary multilevel environment. Phase 1 completed in 2016, the development also features the environmentally sophisticated and innovative Climate Ribbon™, a 13,940 square metre elevated artistic masterpiece of steel, fabric and glass that protects visitors from inclement weather, captures sea breezes to regulate air flow and temperature, collects and funnels rainwater for reuse, and allows visitors to enjoy natural light in an open-air experience. For Bernardo Fort-Bresica, founding principal of Arqitectonica, the objective was to make an urban retail environment, rather than an indoor suburban mall, and to address the realities of Miami’s hot and humid climate. Comprised of 51,600 square metres of retail space Brickell City Centre has created a new downtown for Miami’s most urban renaissance. “The solution was to add another layer to the existing urban fabric instead of disrupting it with a giant box mall,” he notes. 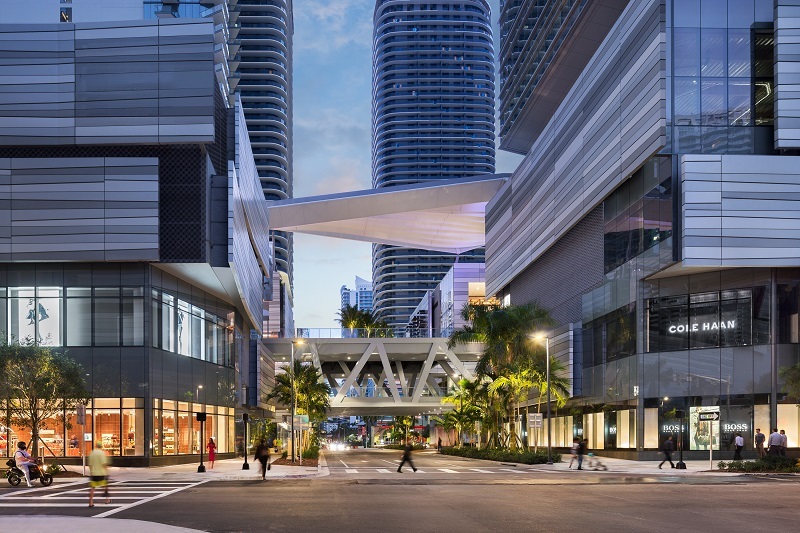 Brickell City Centre’s connectivity excels on many levels and solves the classic urban planning conflict between pedestrians and vehicles with pedestrian bridges across the streets. The third level promenade is linked directly to the adjacent subway station, as well as to the hotel, office buildings and condo towers that are above the podium for easy access to the retail, cinema, cafes and restaurants. The access and egress points to the parking and loading enables vehicles to enter from one street and exit via another, coordinating with the one-way street system to reduce traffic on the surrounding streets. 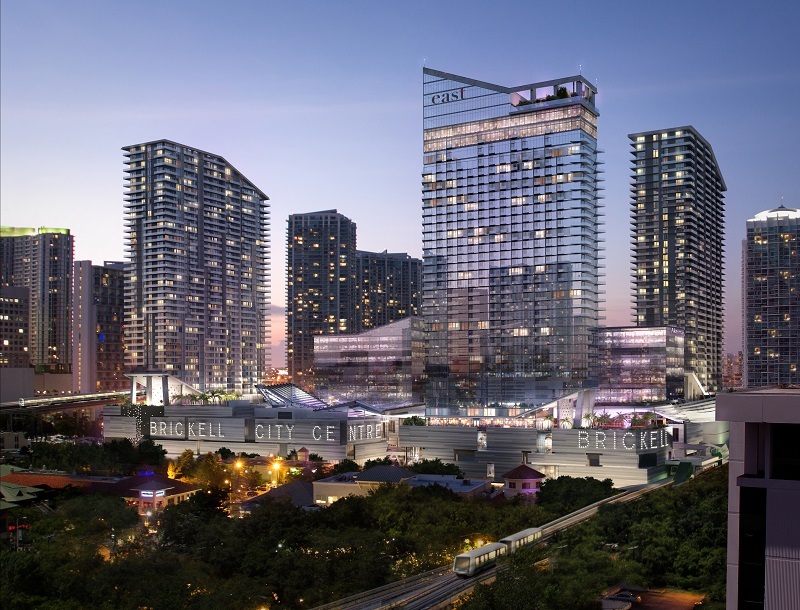 Digital connectivity is provided with a Brickell City Centre application, additionally the Cinemex movie theaters and other tenants also have apps. The Climate Ribbon™ concept was developed at the planning stage to be a continuous canopy that floats above the promenades and maintains a comfortable micro-climate. Engineered by the same French company that created the new court at the Louvre Museum with simulations produced in Canada and manufactured by a German company, for Fort-Bresica it represents a truly global effort. The faceted geometry of the glazing and the flowing fabric ribbons look sculptural but are designed as per careful analysis of the sun angles and breezes. It lifts up to scoop in prevailing breezes and swoops down gently to help propel the breezes along the length of the promenades. The nearly 14,000 square metres of glass also collects eleven million liters of rain water annually in cisterns on each block, used for all the landscaping irrigation. “It is a high-tech 21st century take on an ancient idea, from the souks of Arabia to the exclusive shopping arcade in Milan known as Galleria Vittorio Emanuel, and makes possible a walkable, open-air ‘street’ in Miami’s sub-tropical climate. With the help of new technologies, the sculpted shape is a result of a scientifically derived solution to create comfort through natural means, where no energy is consumed to obtain the results,” adds Fort-Bresica. Brickell City Centre also features 26,100 square metres of office space and is home to EAST, a rooftop hotel with 263 guest rooms and 89 serviced apartments. Standing 40 stories high, EAST’s slender tower is suspended over gardens and pools. The streetside lobby interacts with adjacent shops and connects to a poolside bar and restaurant at the podium roof level. The main body of the tower houses serviced residences in the lower levels and hotel guestrooms in the upper levels. 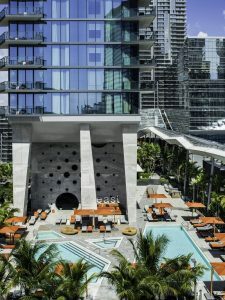 Meanwhile, the top floors are occupied by Miami’s highest conference centre and a bar lounge on the top floor opens out to a tower roof terrace that provides stunning views of the bay and the city skyline. The thin rectangular glass prism of the EAST tower is eroded twice and at the podium roof garden level a triangular space opens to the pool deck to result in a monumental porch. The supporting wall becomes a three-dimensional mural and the tower rooftop is equally eroded to create the sky lounge. The two interventions create a distinctive skyline from distant and pedestrian vantage points. 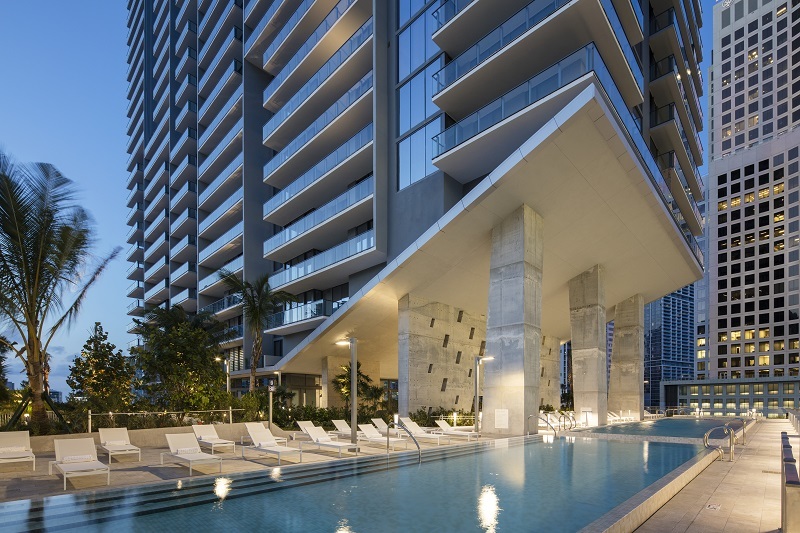 Balconies are distorted into parallelograms inflecting toward the bay and Brickell Avenue to create different readings from different approaches to the tower. On the upper hotel floors the balconies project from the façade and fade towards the base like geometric cascading water or hanging tropical vines, adding a third dimension to the glass prism. Two residential condominium towers with a total of 780 units and hidden parking structures designed to accommodate 2,626 cars and 156 motorcycles make up the space. While the hotel, office and residential towers are each unique they are similar in their objective to create a vision that is sustainable, well-informed and timeless. Use of materials with a long-life cycle such as insulating metal panels, glass facades, unique granite flooring and ceilings made of bamboo planks create a combination of industrial and natural materials. Bridging the man-made and the natural worlds and transforming the essence of sustainability into an aesthetic were also part of the vision. In a space where the city grid meets the waterfront geometry there is an angular undercurrent in the details that reflects the geographic confluence. “Multiple uses also forced us to think three dimensionally and to envision Brickell City Centre as the new hub of activity for the urban core of Miami. Challenges aside, the development has filled a huge void for a significant workforce, as well as tourists and residents that previously had few facilities. Nothing gives an architect more pleasure that seeing an initial sketch become a building and then see the public enjoying it,” concludes Fort-Bresica.